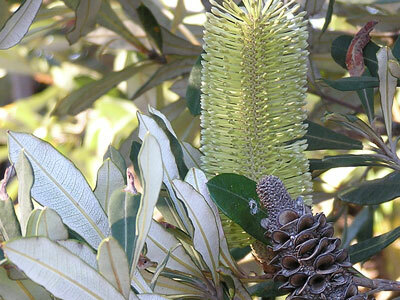 The Coast Banksia occurs frequently along the coast from Melbourne to northern Queensland. 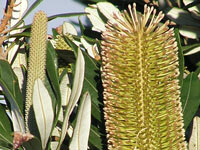 Its distinctive white under-leaf, as well as growing healthily in coastal sand dunes and headlands gives it away. 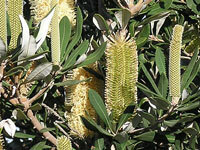 The Coast Banksia's yellow spikes (flowers) appear in Autumn and Winter. 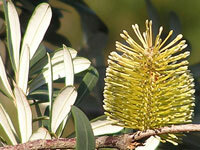 The photos were taken on Botany Bay, and Austinmer on the New South Wales South Coast. 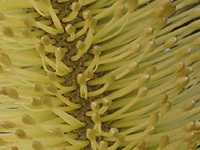 The Coast Banksia has straight yellow styles. 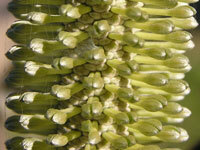 The first image shows the flower spike during its development. The second image shows it fully developed. 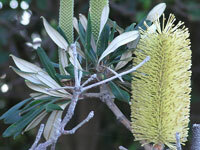 A few more images of the Coast Banksia.